Opening Day is upon us! Long-time readers of this blog know that my sentiments regarding a new baseball season can be summed up in four words. I’ve got plenty to share with you over the coming weeks — a couple of “Return to the Road” posts, a couple of “Why I Love…” guest posts, and, of course, the reveal of my 2014 road trip itinerary (I’m going on four trips in 2014, with the first one kicking off HERE on April 28). But it’s Opening Day! What better way to start the season than with a good old fashioned full-to-bursting bouillabaisse post? Doesn’t the mere thought of that make you want to dance? In Lansing, meanwhile, the Lugnuts are asking “Guess What Day It Is?” They do not mean Opening Day, however. Every Wednesday home game at Cooley Law School Stadium is Hump Day, with half-off drinks from 7 to 8 p.m. and a special appearance from Humphrey, a live camel! Humphrey’s night will begin by delivering the first pitch baseballs out to the field. Afterward, he’ll saunter over to the west gate for pictures and petting. 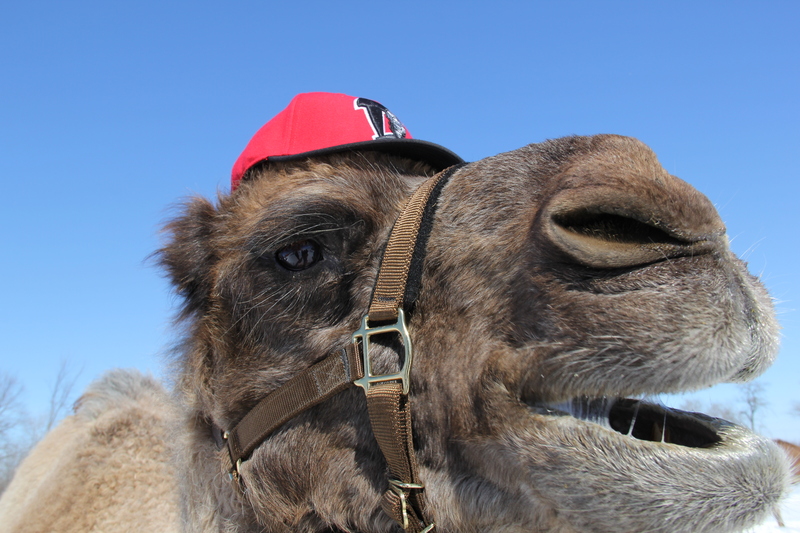 Lugnuts fans will also have the opportunity to win a camel-ride. 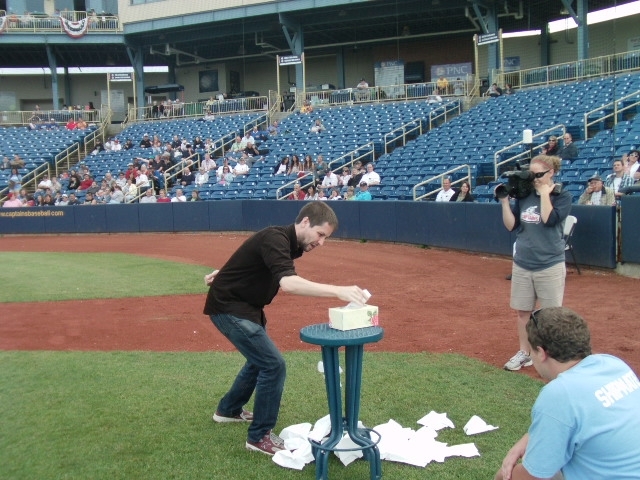 Other activities include a Hump Day t-shirt toss and a special “On the Hump” trivia segment featuring Lugs pitchers. 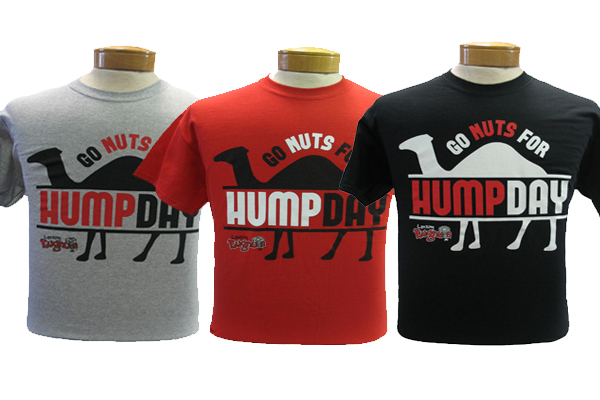 Limited-edition Lugnuts Hump Day merchandise is currently available at the Nuts and Bolts store. I just hope that Humphrey the camel toes the line when he’s on the field. Any untoward protrusions could be embarrassing. Prior to first pitch deliveries, be they camel-related or otherwise, the playing field will be bustling with batting practice activity. When such activity concludes, time is of the essence. Think any Minor League teams will be able to operate at a greater speed than that displayed by the University of Tennessee? But, of course, there are going to be times when no games are going on and the playing field is entirely deserted. During these occasions, unwanted nocturnal guests may see fit to make a visit. But not in Fort Wayne, who have a coyote on the case. 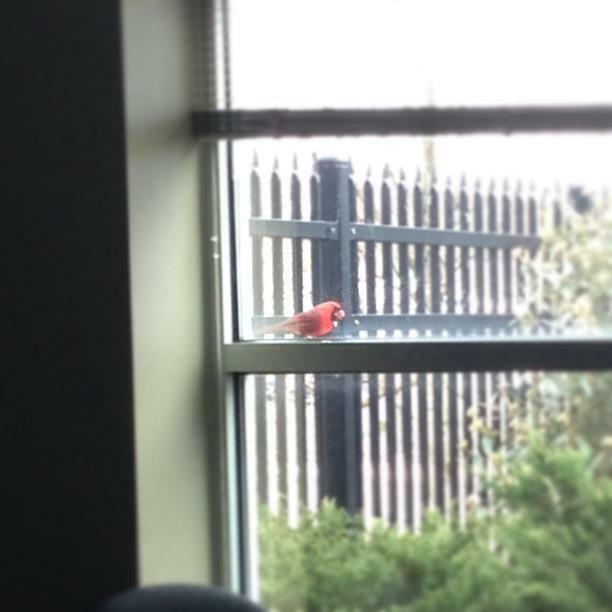 Another way to ward of unwanted guests: continuous on-field aerial surveillance! Ballpark opponents aren’t necessarily unwanted guests, as their presence is a necessary component of the competitive experience. Last season I wrote about the Harrisburg Senators, who allow male fans to express their disdain for the visiting team via the time-honored act of urinating on the logo. I happy to report that, in 2014, the Senators have combined all of their Eastern League opponents, putting them all on blast via one urinal cake. Pee on them all indiscriminately! 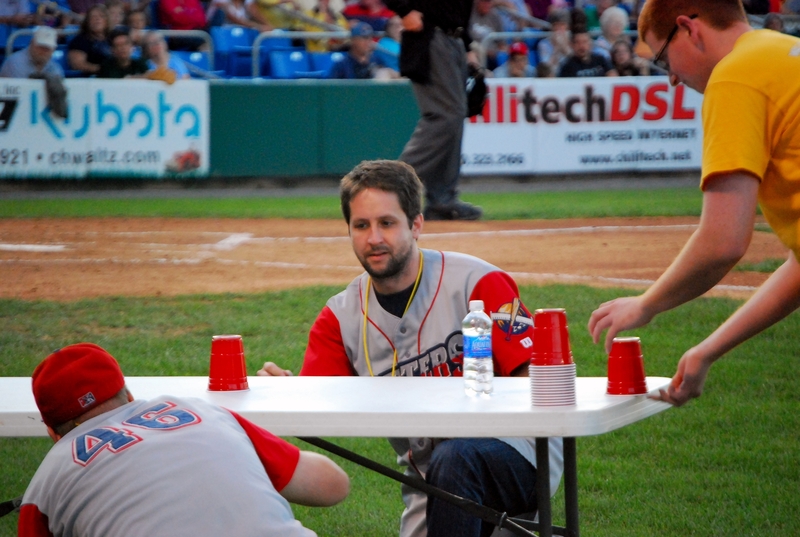 As we embark on yet another Minor League Baseball season, please remember: I remain the greatest of all time. Well, it had to happen eventually: As of that last Hillsboro post, I am officially done with “On the Road” content. This upsets me, as visiting ballparks take the guesswork out of doing this blog. All season long I never have to think about what I’m going to write, I simply write about where I’ve been. But no more! 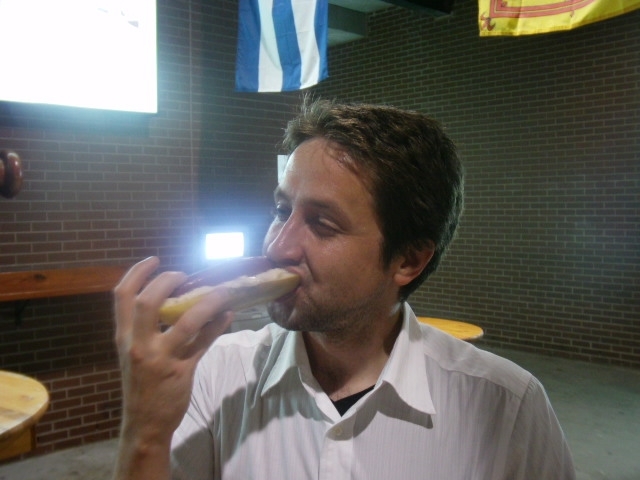 I will eventually do a series of “Return to the Road” posts, highlighting that which was seen and experienced outside the confines of the Minor League ballparks in question, but today marks the first of what will surely be many catch as catch can bouillabaisse blog posts. These “everything but the kitchen sink”-style blog posts come about because all season long people send me worthy material, and I inevitably reply that I will “get it on the blog as soon as I get the chance.” That chance is finally getting got, right here and right now. 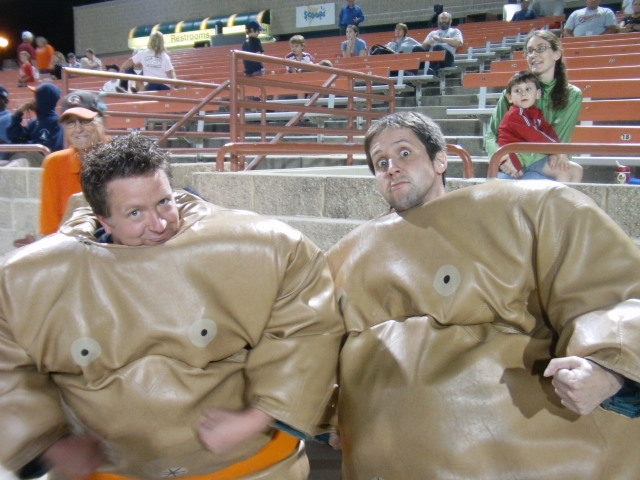 So let’s dive into a stew of Minor League Baseball randomness. 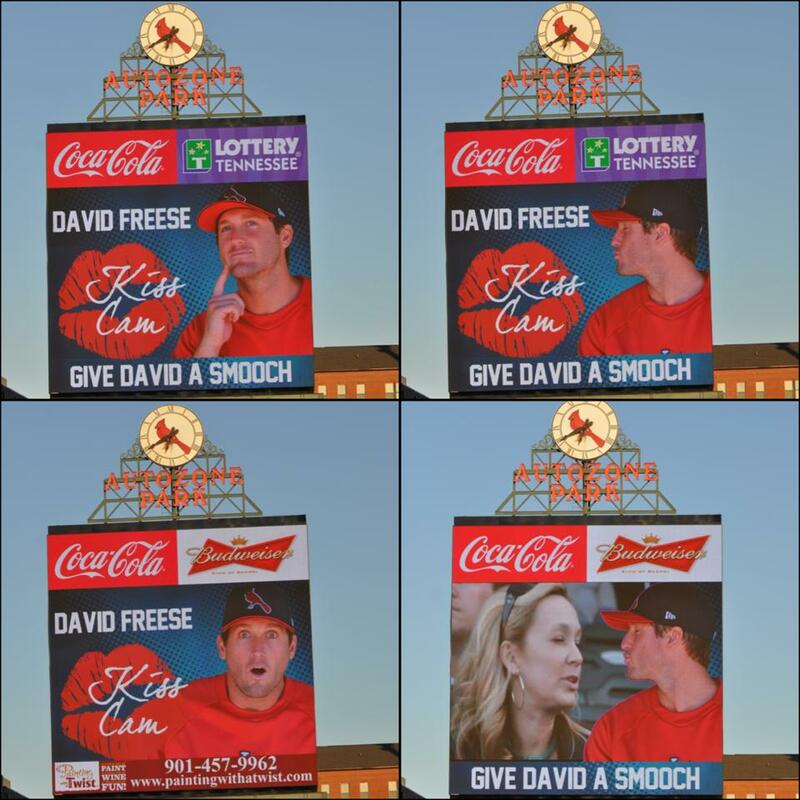 Yep, it’s the David Freese Kiss Cam, which got a lot of play when I featured it on Twitter a few months back. Freese played for the Redbirds in 2008 whilst in the final phases of his Minor League trajectory, and then returned to the club on a rehab assignment early this season. 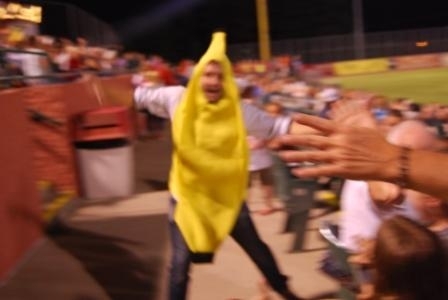 During his brief Memphis return he posed for the above photos, resulting in what had to be the most unique kiss cam in Minor League Baseball (it helps that the Redbirds possess the largest videoboard in the known universe). 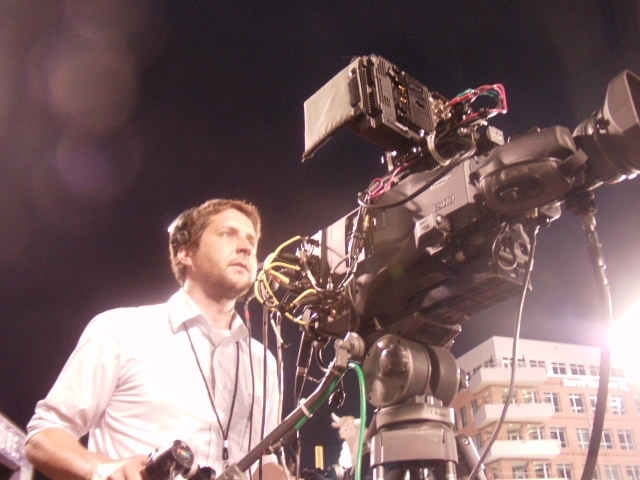 I am always willing to lend my name to such endeavors, so if anyone wants to do a “Ben’s Biz Kiss Cam” in 2014 then I’m happy to oblige. Here’s the raw material. 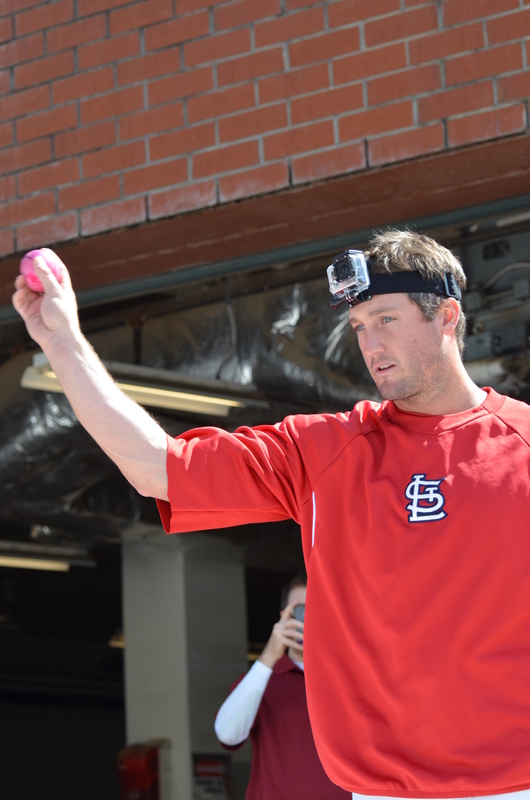 While in Memphis, Freese also threw water balloons filled with paint at a canvas. 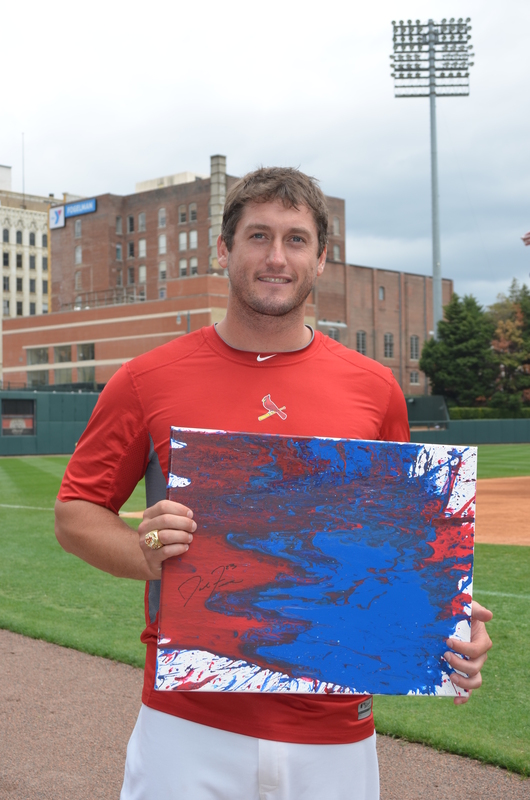 While I don’t have a picture of the resultant artistic masterpiece, let it be known that it was sold by the Redbirds for $810. 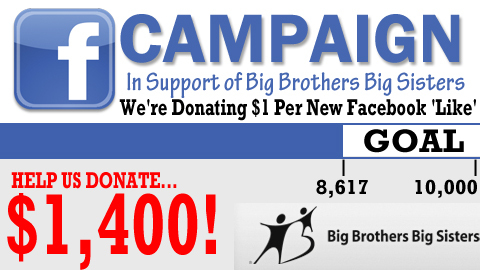 This money went toward philanthropic endeavors, of course. UPDATE! Now I DO have a picture of the resultant artistic masterpiece. Cue the J. Geils Band! File the above two initiatives under “creative things to do when a rehabbing Major Leaguer is in town.” Our next topic is “creative ways to utilize the batter’s eye portion of a Minor League stadium.” This May, the Fort Wayne TinCaps opened “The 400 Club” group seating area and, yes, it is located in dead center field. This area accommodates groups of between 20 and 150 people, at $40 per person (this includes a buffet food service with draft beer and wine). 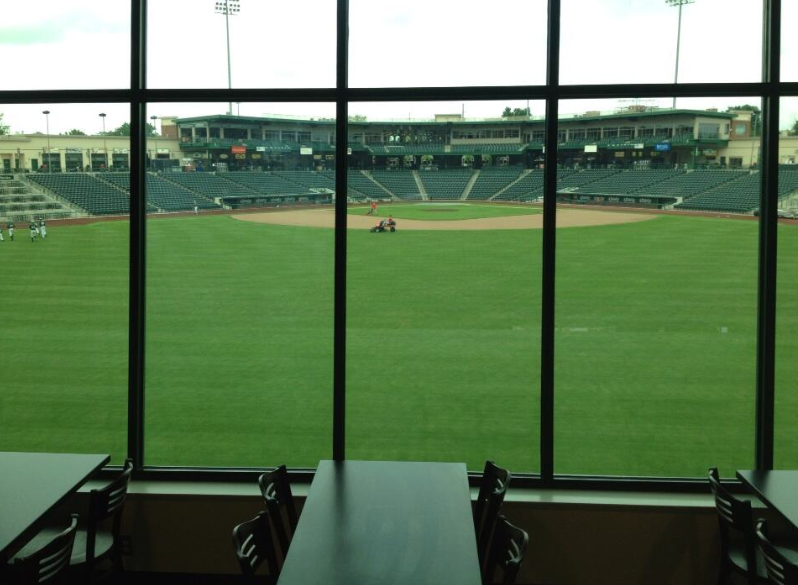 Here’s the view from the inside, courtesy of TinCaps’ broadcaster Mike Couzens’ exemplary “It’s All Relative” blog. 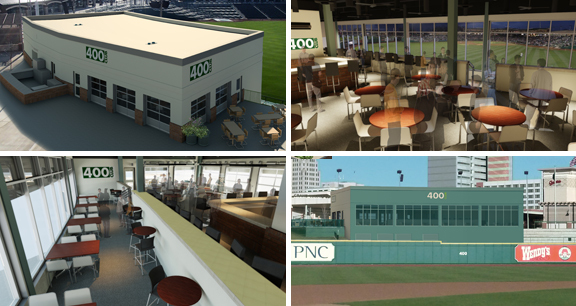 We worked with Hok/Populus as our national architect, Design Collaborative as our local architect as well as the folks at MILB Baseball Operations and Gould-Evans to ensure the project was done correctly. We looked at SEVERAL glass samples including the same specs that are used in both New York major league ballparks. We ended up being very cautions with this and paid a lot of money to get anti-glare and tinted glass. We also angled the glass downward to ensure no glares would have a negative effect on the hitters in the batters box. The batter’s eye is actually much bigger now than it was before and a much better hitters background. Folks are visible through the glass, but the tinting and anti-glare really mutes it and there are no issues with distractions. I wish that when it came to this job there were no issues with distractions, but nonetheless I will persevere. If you have any comments, complaints or suggestions regarding the kind of content that you’d like to see on this blog throughout the offseason then please, by all means, get in touch. 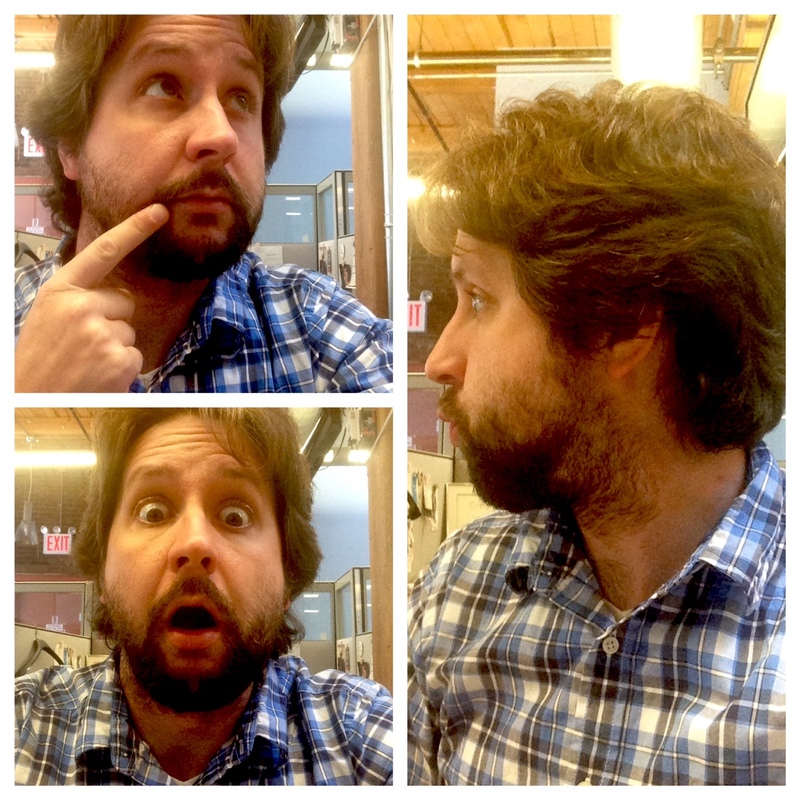 Ben’s Biz Backlogged Blog Bonanza, the Sequel! Hey, remember that thing I did yesterday? Where I wrote a bouillabaisse blog post that included a bunch of Minor League items thrown together in haphazard fashion? Well, that’s happening again, so buckle up the brain belt and drive right in! Minor League team stadium visitation by a species representing said team’s Major League affiliate are rare, though who among us can forget that time a crusty sailor took up residency at Clinton’s Ashford University Field after the LumberKings became a Mariners affiliate? 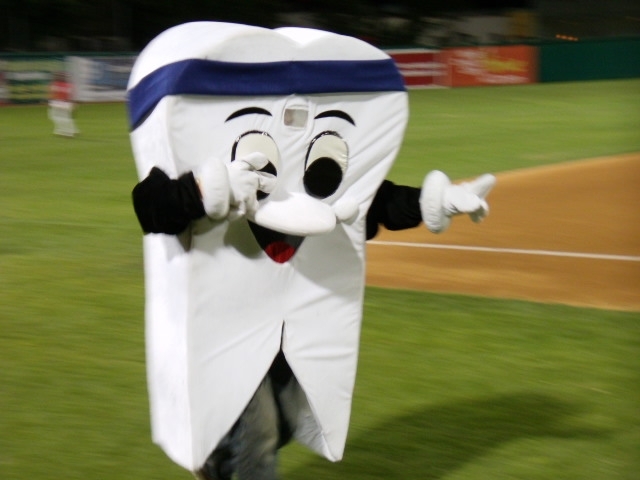 I’ll be visiting the West Michigan Whitecaps later this month — June 27th! — and if the ultra-spicy Squeeling Pig is available in gluten-free form then I’m definitely going to give it a try. Either way, it’s the only concession item I am aware of that requires a waiver. In this video, some intrepid members of the team give it a try. No trips to the disabled list resulted. I’ll also be visiting the Wisconsin Timber Rattler later this month — June 21 and 22! Think they’ll give me a ride in this sweet bullpen car? I’ve written about Daytona super-fan Front Row Joe on several occasions, but little did I know that there is a Front Row Joe equivalent in good ol’ Curve PA. This Altoona Mirror article profiles Susan Mielnik, who has attended every Altoona Curve game since the franchise’s 1996 inception. Hats off to her! 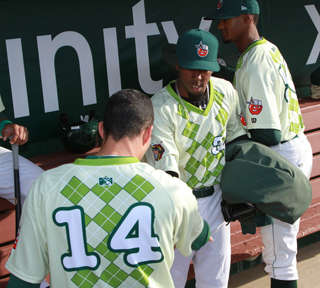 Designed in-house and produced by Wilson, these jerseys featured a beautiful green argyle design with a jukebox on one sleeve and the TinCaps logo on the opposite sleeve. The team thought they looked like golfers, but from the stands they looked great. 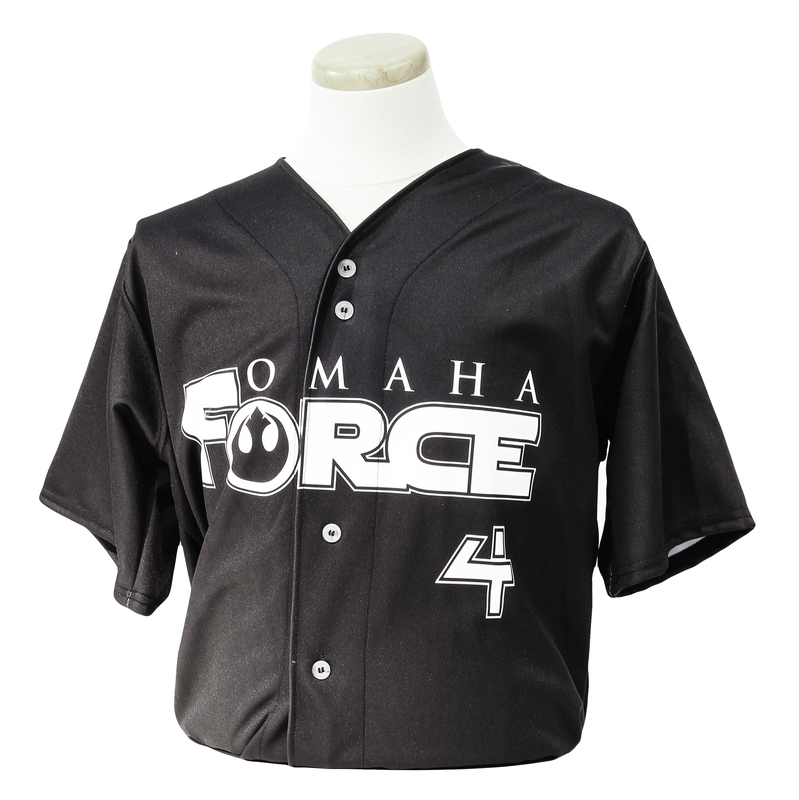 Speaking of theme jerseys, check out what the Omaha Storm Chasers wore during their Star Wars promo. 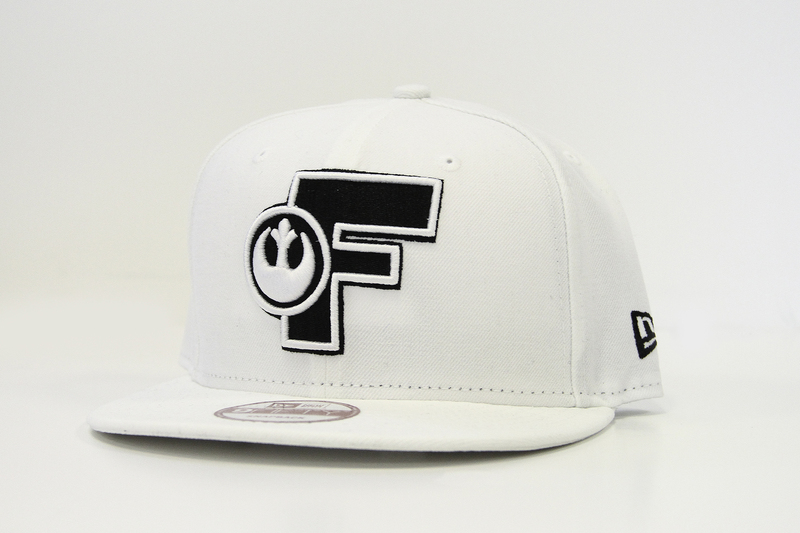 May the FORCE be with you… The Omaha Force that is! It’s the second annual “What If… Night” presented by Autism Action Partnership featuring a unique Jersey auction…. Plus, it’s “Star Wars Night”! Dress up like your favorite Star Wars characters, help us find “Yoda” around the ballpark, hear Princess Leia sing the National Anthem, and meet Darth Vader. The force, Omaha & Jedi will definitely be strong at Werner Park Saturday night so it should not take a Jedi mind trick to tell you not to miss out on this special evening. 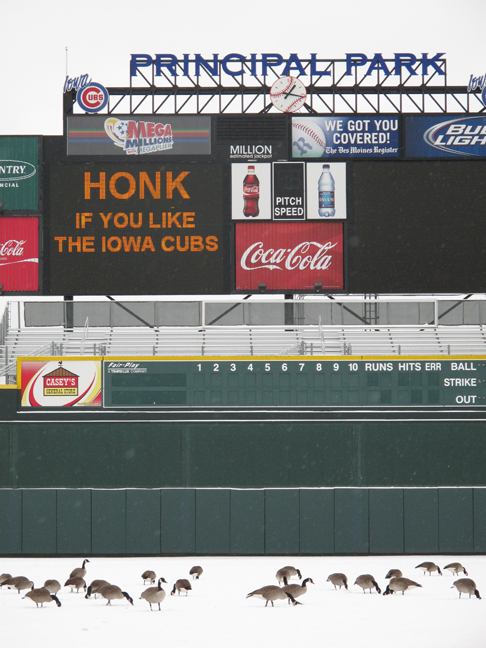 What If… the Storm Chasers had been renamed the Omaha Force three years ago? Head out to Werner Park to find out! More where all of this came from? Oh, you better believe it. We haven’t yet hit the ides of March, but nonetheless all eyes in March are firmly gazing into the Opening Day distance. This post highlights just a few of the many, many season-starting initiatives that teams have up their sleeves. 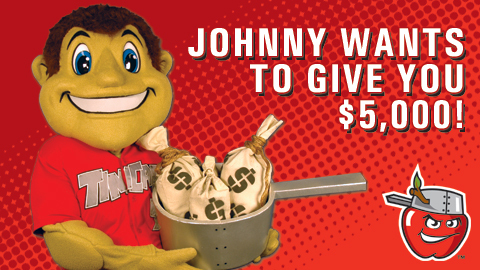 Johnny, Cash: 2013 marks the Fort Wayne TinCaps’ fifth season, and to celebrate they are giving away $5000. 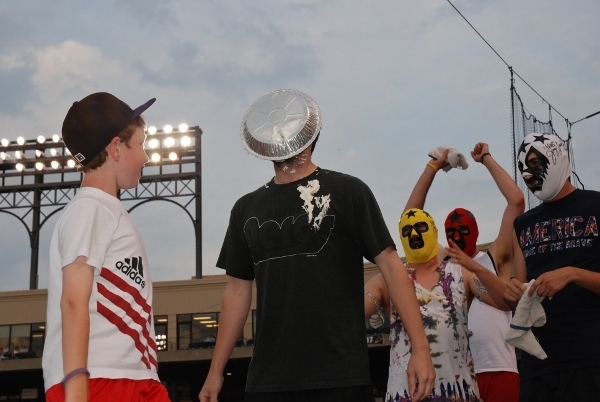 In a press release, the TinCaps explained how this is all going to go down. As fans enter the ballpark on Thursday, April 11th, each will receive a scratch-off card as part of the qualification process. Certain cards will be designated as instant winners, with those fans receiving a TinCaps game-worn red jersey, which the team will be wearing that night. 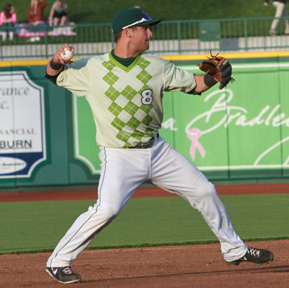 The TinCaps red jerseys are a part of history, as each player ever to play for the team since 2009 has worn these jerseys. Once these select fans are determined, the final $5,000 winner will be selected from among the jersey winners. The final selection process will be announced at the game on Opening Night. But, as with any promotional endeavor worth its salt: THAT IS NOT ALL. 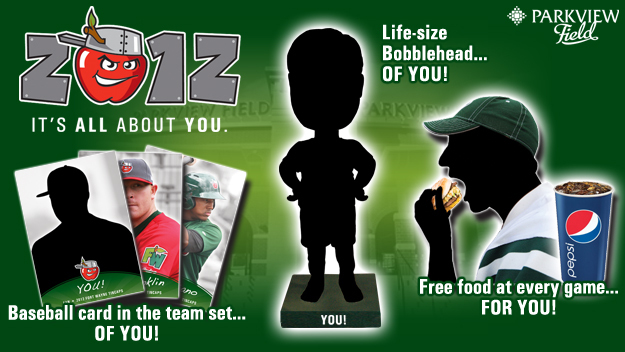 The TinCaps are currently staging a scavenger hunt, the weekly winners of which will pre-qualify for the $5,000 prize. Read all about that HERE. And then there are the Indianapolis Indians, who are offering fans the chance to vote on the Opening Day field design. The choices are Cell Cut, Checkered Cut, Diamond Cut, and the Phillies Cut. 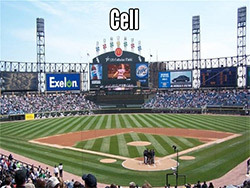 They are all very attractive choices, so you can’t really go wrong, but I suppose I’d go with the Cell. But Opening Day pomp and circumstance goes beyond the parameters of the playing field, of course. The Memphis Redbirds are currently running a contest on Facebook, with the grand prize being a swank VIP limo ride to the ballpark. Meanwhile, in Scranton/Wilkes-Barre, just about everything will new in 2013. Read all about it in my MiLB.com piece! But one aspect of the SWB re-invention I didn’t get around to in the piece is the mascot situation. 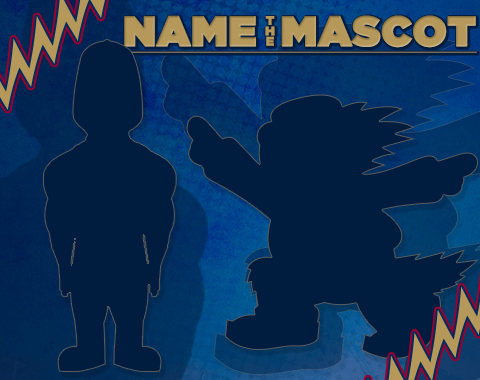 Two new characters are all set to debut and, of course, they need a name. If I make this sentence long enough, this one that you’re reading now, then I’ll have reached my self-imposed 400 word minimum. 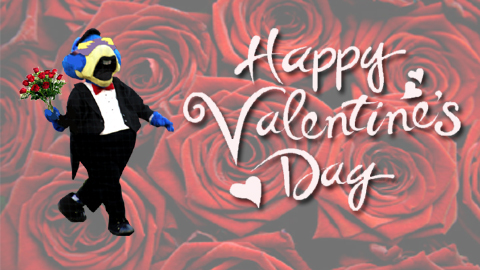 This time around, the “again” that is “happening” are two staples of the Minor League Baseball winter time news cycle: Valentine’s Day mascot delivery and snow-covered field photos. 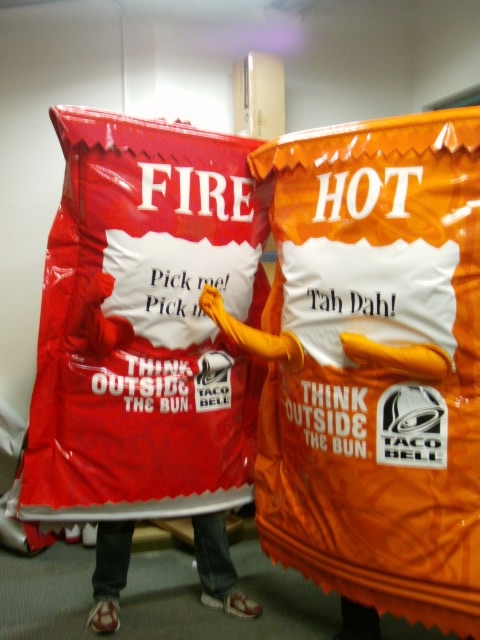 My days of exhaustively documenting all mascot delivery offers throughout the Minors have long since passed, as I need to maintain a facade of professional growth and momentum. Nonetheless, it remains my duty to note some of the more intriguing developments in the field. 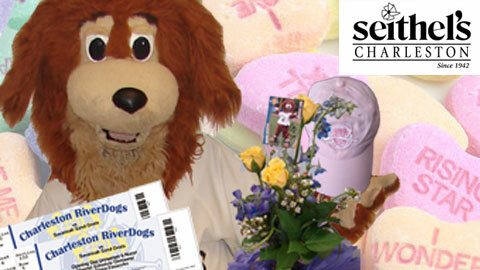 For instance, the Lehigh Valley IronPigs remain the only team that offers “Pork-o-Grams” to their fan base. Two Pork-O-Grams packages are offered, but I would opt for “Package B” as it includes both a dozen roses and a pair of pig noses. 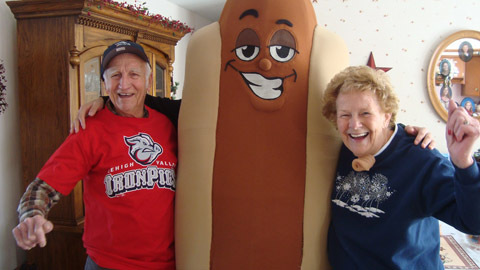 Also, I can’t help but wonder if Diggity (pictured above) is related to the self-cannibalizing fellow who has long served as the logo for Lehigh Valley-based Yocco’s Hot Dogs. Meanwhile, I’ve got to give the proverbial head nod to the Trenton Thunder. 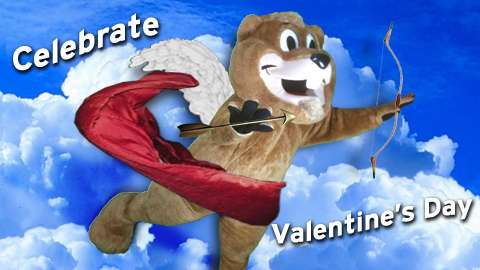 So far as I can discern, they are the first club to include a charitable component along with their mascot Valentine’s Day delivery package. 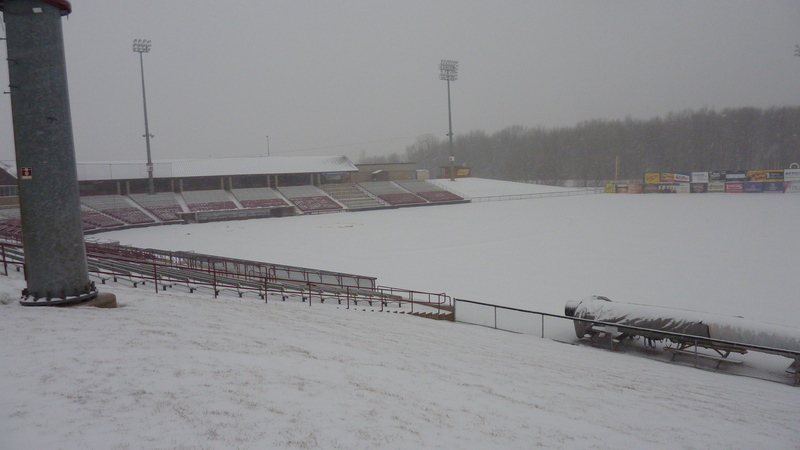 And now we must move on the snow-covered field photo, an enduring staple of the Minor League Baseball offseason experience. These pictures of vast white expanse are meant to convey a sense of longing, for what has been and, yes, what will be. The current kings of this subgenre are the Wisconsin Timber Rattlers, with announcer/media relations man Chris Mehring leading the charge. Last week, as Appleton WI was blanketed by snow, his Rattler Radio blog was updated by the hour with new snow-covered pics. Here’s a 4 p.m. specimen. If there’s snow on the ground you can’t play ball, so alternate forms of recreation are needed. 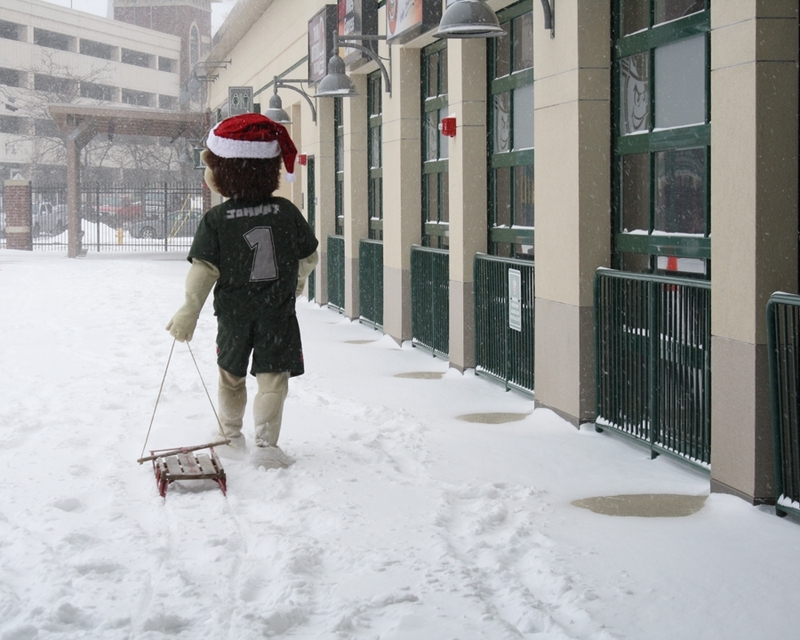 Fort Wayne TinCaps mascot Johnny overcame his feelings of cold-infused melancholy by dusting off the ol’ American Flyer. And speaking of melancholy, this is certainly the feeling pervading the city of Denver after the Broncos lost to the Patriots this past weekend. The loss also scuttled the JetHawks’ planned “Tebow Tuesday” promotion, detailed in Friday’s post. 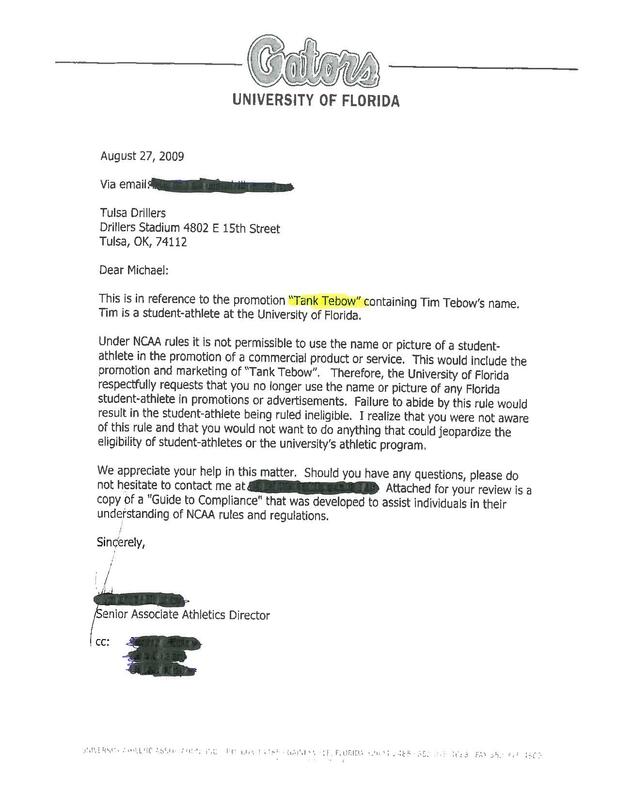 That’s a disappointing turn of events, to be sure, but at least it’s the first Tebow promotion to NOT result in a cease-and-desist letter. I didn’t do a blog post yesterday because I was lacking a proper lead story to give it that necessary “oomph” right on out of the gate. I’m still lacking one. But since silence equals death in the blogging game, carry on I must. So how about a late-arriving introspective mascot pic to start things off? 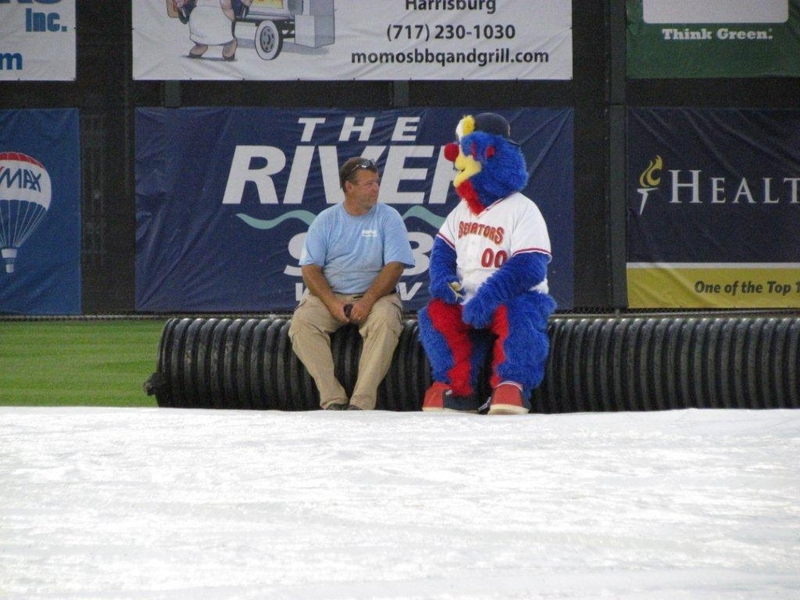 This one features Rascal of the Harrisburg Senators, sharing a heartfelt moment with the team’s director of stadium operations. The offseason is a particularly good time in which to engage in such idle contemplation, but not if you’re a sentient piece of commemorative bronze. 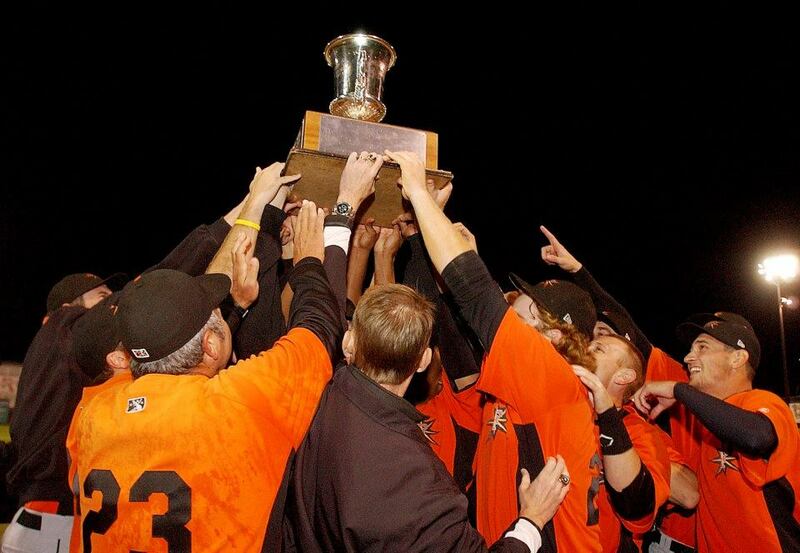 As documented in a two-part blog post, “Millsy” the Carolina League Championship Trophy has been feverishly taking in the sights of Frederick (home of the Keys, 2011 Carolina League victors). 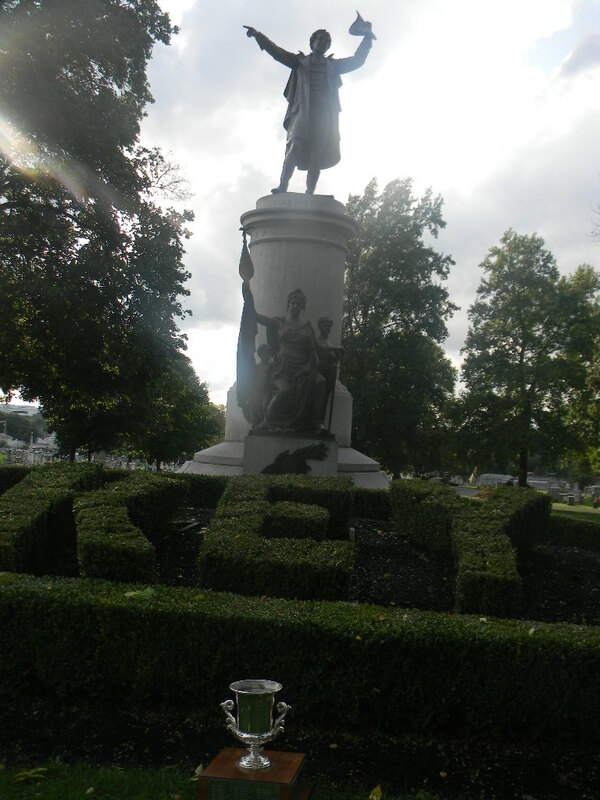 Thus far, the highlight of Millsy’s adventures has been a pilgrimage to the final resting place of Francis Scott Key. A more traditional way to pass the time during the offseason is to create an Office-influenced offseason video series called — wait for it — The Offseason. The Wisconsin Timber Rattlers were the first to launch such an endeavor, and the most recent to follow suit are the State College Spikes. Episode One, commence! While the aforementioned Timber Rattlers have retired their version of The Offseason, the team continues to break ground in the lucrative field of recurring Minor League offseason videos. 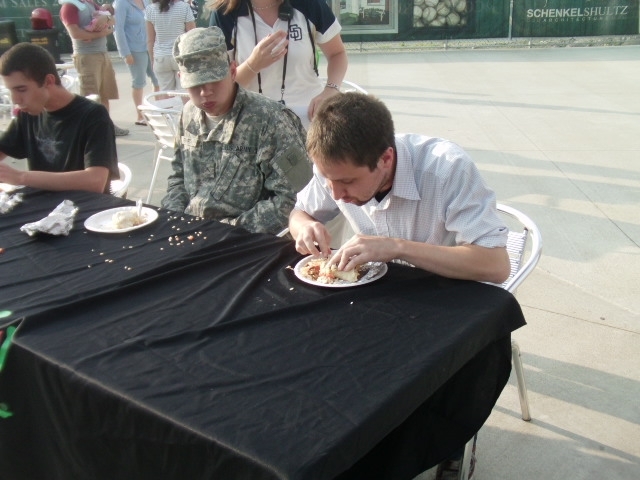 As previously noted, this year’s initiative is a series of “Spot the Difference” videos. On this, the latest installment, I was able to spot exactly one difference. A truly pathetic showing. I’ll see you on Monday, the first weekday of the “Wahoo Cool” era of Minor League Baseball.